Every year PAX East, the biggest video game convention on the East Coast, hosts a panel about breaking into games journalism. It’s a chance for editors and writers accustomed to working remotely via Twitter and Slack to step aside from the raucous and competitive tournaments, the massive banks of game demo screens, and the cosplayers in devil-horned League of Legends get-up, and have an in-person advice session on how to pitch a feature story or self-publish. This year the focus was on what happens after you break in. What is it like to actually make a career of games journalism? As a former editor for Computerworld magazine and now a freelancer, podcaster, and YouTube content creator, I know how fun and creative jobs in publishing can be. They can also be competitive, challenging, and unrewarding. Wanting to share these truths with the PAX audience, I recruited several writers and editors I’ve read or worked with to present the panel “You’re a Games Journalist! Now What?” Joining me were Susan Arendt, managing editor of GamesRadar+; Samit Sarkar, senior reporter for Polygon; Alexa Ray Corriea, editor at GameSpot; and Holly Green, features contributor for Paste Magazine. It took me a long time to become the kind of writer that Arendt would want to work with. Ten years ago I was so defensive about my first draft and so impossible to work with that an editor nearly walked out of the room. I’ve since learned that my best writing can only be achieved with the help of a good editor; now I’m eager for a professional perspective on how I can improve any piece of writing. Whether those skills are learned on the job or in the classroom or are self-taught, it’s essential to have those tools at your disposal. When I started my journalism career at a daily paper, a writer who could also do print layout was invaluable. Now someone who can input their own content into a CMS such as WordPress, shoot and embed video footage, apply search engine optimization metadata, and promote the package on social media is worth their weight in gold. I incorporate these experiences into my course at Emerson College, teaching my students the breadth of skills necessary to be proficient across multiple media. Arendt also emphasized the importance of “soft” skills: those which might not be listed on a résumé but which make you a better team player. It’s about “how well you deal with people, how you deescalate conflict, and how you learn to communicate with different personality types.” In my case, it means knowing that I’m better at defusing tense situations on the phone than via email. “That is an excellent example of a soft skill,” said Arendt: “Knowing that about yourself, or knowing that about someone else you work with. Fortunately, there’s an alternative to a staff position with long hours for little pay. “Freelancers make dope cash — just saying,” suggested Corriea. It’s true: I have a network of Computerworld alumni who find freelancing more profitable than a steady paycheck — but none of them is writing about games. The rates that gaming outlets pay their writers often top out at 25 cents per word, whereas it’s not unusual for mainstream or business publications to pay $1 per word. “You will make way more money doing this same exact thing in another industry,” confirmed Arendt. Despite the challenging schedule and salary, this line of work has at its heart people who are passionate about video games. Are games still fun when you do it for a living? Yes — but actual game time is only a small part of how journalists spend their days. “I have to do all the boring stuff like sitting in on budgetary meetings, and feature planning, and overall strategy,” said Arendt. For Green, games equal assignments: “There are so many games on my schedule, it becomes very difficult to manage.” And for me, I spend more time editing gameplay videos than I do shooting them. We may all get to play games on the clock, but that privilege comes with many other responsibilities that you have to love, or at least tolerate. While the editors revealed the sobering realities of games journalism, they also emphasized the dreams realized by such a career. 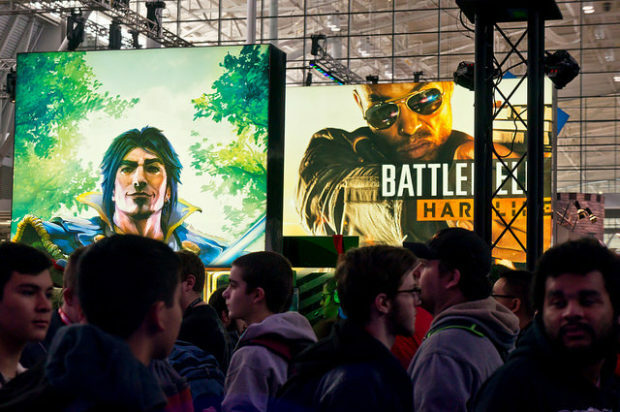 Corriea was invited to be on a PAX East panel about Tomb Raider, which gave her a chance to discuss one of her favorite franchises alongside its creators. Green wrote, crowdfunded, and self-published the video game cookbook Fry Scores. Arendt gets to write about Doctor Who, a show she’s been watching since she was eight years old. Sarkar gets previews of SyFy movies such as The Magicians. And I launched a YouTube channel that’s been seen by millions, fulfilling a childhood dream. Ultimately, that’s what happens next after your successful pitch: maybe you’ll make a living at games journalism; maybe not. But it can definitely be a part of your life — one that those with talent, ambition, and patience will find incredibly rewarding. Ken is the host of the Polygamer and IndieSider audio podcasts, where he interviews marginalized voices in the gaming industry. He frequently speaks at events such as PAX, GaymerX, and KansasFest on the topics of equality and diversity, indie and empathy games, and crowdfunding. Ken is a freelance writer for Computerworld and teaches in the publishing department of Emerson College. Find him on Twitter at @Gamebits.